OIL PRICES HAVE today hit their lowest level for five-and-a-half years. West Texas Intermediate – a grade of crude oil used as a benchmark for oil pricing – marked prices down to $48.49 (€40.70) a barrel, a low that hasn’t been seen since April 2009. 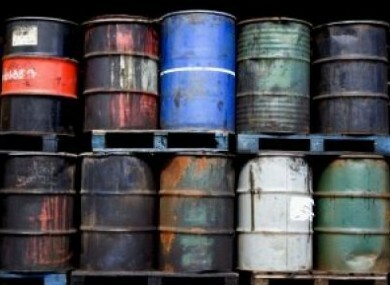 In London this morning, Brent North Sea crude had its delivery for February down to $51.23 (€43) a barrel. The oil price fell further to pring fresh five-year lows… on a combination of over-supply fears, a Saudi state-owned oil company cutting prices to Europe and the US, a strong dollar and the increased bets on further falls. The dollar has been enjoying a period of strength that has attributed to the fall in oil prices. Yesterday the euro hit a nine-year low against the US currency – this comes before expected quantitative easing stimulus from the European Central Bank. There are also concerns regarding Greece’s possible exit from the Eurozone. While the crash in oil prices is bad for oil traders and producing countries – it is good news for the Irish consumer. According to consumer website fuels.ie, prices have fallen to as low as 121.9c for a litre of petrol and 114.9c for a litre of diesel. The cheapest petrol was to be found at a station on Enniskillen Road in Belturbet, Co Cavan – while the country’s cheapest diesel is being sold at Gabota Oil Ltd in Clondalkin, Dublin 22. There had previously been criticism around savings in the global oil market not being passed on at the fuel pumps. Figures from the CSO showed that prices had gone down by only 3% for petrol and 5.5% for diesel during 2014. This was mostly put down to the high taxes placed on fuel in Ireland – which are not adjusted in line with the decline in the global price of oil. Email “Oil is cheaper today than it has been for nearly 6 years ”. Feedback on “Oil is cheaper today than it has been for nearly 6 years ”.